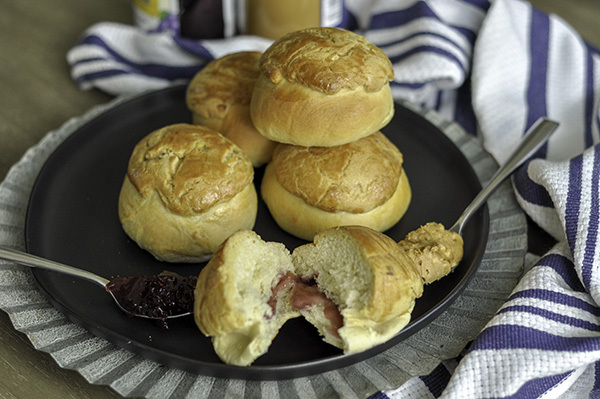 These buns are soft, fluffy, feathery and filled with grape jelly. Then topped with a sweet and crispy peanut crust. The topping is made of a mixture of butter, cake flour, sugar and crunchy peanut butter. You can also use creamy peanut butter, but I personally like a few little crunchy pieces in there! Once all the topping ingredients have been mixed together, I place it in the fridge to chill with the dough proofs. To fill the buns, I find that the jelly is actually easier to work with than jam since its so much more gelatinous and holds its shape better, which makes filling the dough much easier. I must admit there were a couple of buns that I probably didn't seal well enough as some of the jelly leaked out as they were doing their final proof! But even with a slight leak the filling stayed intact after their bake! Woo hoo! Scroll below for more pics of the bun shaping process! Once the buns are filled with jelly, I let them proof for another 30 minutes. Near the end of the 30 minutes, I rolled out their little peanut butter helmets. The topping dough is rolled into tiny balls about the size of a ping pong ball. I place it in between two sheets of wax paper and roll it out into a small disk. The disk doesn't have to cover the top of the bun, just big enough to place on top. Place the disk on top of the buns and brush with egg wash. Then back for about 15 minutes or until golden brown. I baked these in the middle and top of my oven and found that I had to rotate the sheet trays in the middle of the baking process to ensure an even brown color. I think its mainly because of my oven, but check them about halfway through the bake just to make sure. Once browned, allow to cool on the sheet trays for about 10 minutes and enjoy. I love eating these warm, but they are also great room temp (as my husband likes to eat them) They stay fresh for about 2-3 days at room temp or you can microwave them for about 12 seconds to eat it warm! You'll never want a regular peanut butter and jelly sandwich again! Add the cake flour, powdered sugar, peanut butter, baking soda and baking powder, and mix until everything comes together into a dough. The dough will be similar to a sticky cookie dough. Spoon about 1 tablespoon of jelly into the center of the bun and carefully seal it up pulling the edges of the dough out and then pressing the opposite sides together. Careful do not to touch the filling with the edges of the dough, because once it gets wet, the edges won't seal. Once almost done rising, take the crust dough out the the fridge and shape into small balls (approx 1 tbsp) flatten out the dough into a disk. Place the disk of dough onto the tops of the risen buns. No need to be perfect here! You want them to look a bit rustic and craggy. Repeat with all the buns. Preheat the oven to 400F. Brush the tops with a good amount of the egg wash and bake for 15-18 min or until golden brown.